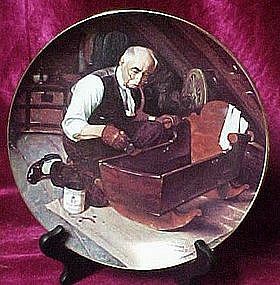 This beautiful plate by Norman Rockwell is a grandpa painting a cradle. On the back of the plate it reads Plate number 17291P, is the only limited edition of "Grandpa's Gift" by Norman Rockwell. First issue in Rockwell's Golden Moments series. Norman Rockwell's tribute to the joy of the golden years. "Grandpa's Gift" was specially selected and approved the the Norman Rockwell Family trust and certified as a true "Rockwell Classic" by the Rockwell Society of America. It is made in fine Knowles china in an edition strictly limited to 450 firing days. This grandfather gives the gift of himself a golden moment that only he and his family can cherish. Thomas Rockwell. Has box & Certificate of Authenticity. Never displayed, Excellent! !